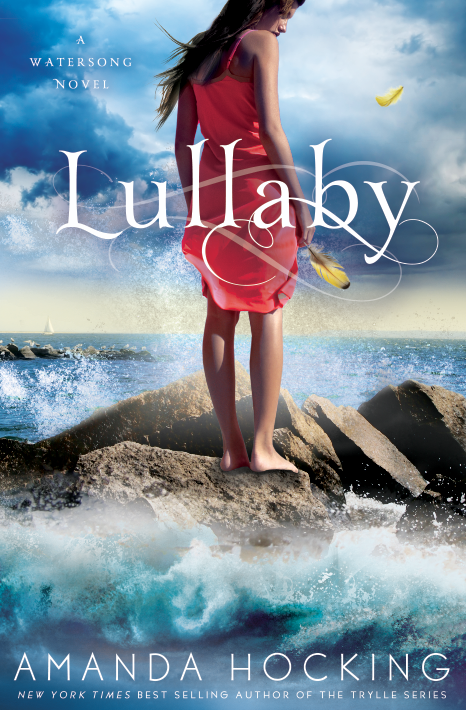 Lullaby – the second book in the Watersong series – will be out November 27, 2012. It originally wasn’t go to be out until February, but they’re bumping up the schedule, so all the books will be coming out sooner. Beautiful. Fearless. Dangerous. They’re the kind of girls you envy; the kind of girls you want to hate. Strangers in town for the summer, Penn, Thea, and Lexi have caught everyone’s attention, including the eye of practical Harper. But it’s her sister, Gemma, they’ve chosen to be part of their group. Sixteen-year-old Gemma seems to have it all – carefree, pretty, and falling in love with the boy next door. But her greatest passion has always been the water. She craves late night swims under the stars, where she can be alone yet belong to the sea. Lately she’s had company. Penn, Thea, and Lexi spend their nights dancing, singing, and partying on the cove–and one night Gemma joins them. When she wakes up groggy on the beach the next morning, she knows something has changed. Suddenly Gemma is stronger, faster, and more beautiful than ever. As she uncovers the truth about her new mythical powers, Gemma is forced to choose between staying with those she loves or entering a dark world brimming with unimaginable secrets. Wake will be out August 7, 2012. The description for Lullaby is coming soon. Also, for fun, here is the soundtrack for Lullaby, if you want to check that out: here. Hey!There are 37 days left!CANT WAIT! Carnt wait for it to come out! Wake was so good! I finished it the day i bought it! Cant wait for lullaby!!! I just finished Wake, thank you St. Martin’s for the advance copy and I can’t wait for Lullaby!!! Thanks Amanda for the great reads!!! GREETINGS … YOUR BLOG IS VERY GOOD, WE LOVE IT, SO YOU GRANT RECOGNITION GdelI.PUEDES the awards SEARCH THE BADGE ON THE WEB. WOW! What a great cover to go with a fantastic story! It’s beautiful! I can’t WAIT for the Watersong series to come out! You are such a brilliant storyteller! By the way, I nominated you for a fun little Reader Appreciation Award (for details see: http://unearthingwords.wordpress.com/2012/06/18/reader-appreciation-award/). You’re amazing and such an inspiration to the aspiring writers out there! That cover is beautiful! I can’t wait to read Wake! This series is going to be amazing.